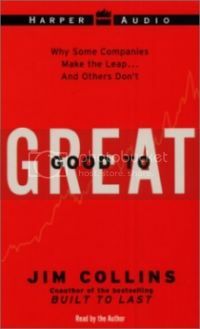 Jenny gave me a book a few years ago called Good to Great by Jim Collins. When she gave it to me she said, "I saw this on the shelf, and I just thought of you." It was one of the nicest compliments I ever got. However, even though I'm happy, I'm rarely if ever content. I have started reading a lot of similar blogs about personal finance and jobs. While I really enjoy them as I think I can add a lot to them because of my own personal experience, they are all focused on getting to where I am today. How do I make it to the next step? How do I go from good to great? Where is the information on how to do this? When Tyler talked about finding your niche on the blogosphere, it got me thinking where would I find my niche. Certainly not in the "make money online" space or the personal finance space. Those are pretty crowded areas. What isn't crowded is the space I'm looking for, people who have found success but want to take the next step. I know I'm not alone in this. Rick is trying to get there with me (and while I have a good head start, I think he will beat me to the finish line) as are most of my friends. Hopefully, as we go on this journey together, we can figure out just what it takes to go from good to great. Yes, I suppose I should define what I think is "good" vs. Great. I'll do that in my next post. I totally forgot I gave you that book.